Chemolithoautotrophs are commonly found in the deep sea, in caves and hydrothermal vents, where conventional energy sources, such as sunlight and organic carbon, are lacking. "The microbes obtain their energy from the oxidation of inorganic compounds, such as hydrogen, iron and sulfur," explains Bin Bian, a Ph.D. student from Saikaly's team. The microbes strip the inorganic compounds of electrons while taking up CO2 and reducing it to organic products as part of the process. The team developed an alternative MES reactor using cathodes made from stackable, cylindrical porous nickel fibers that Saikaly's group had previously applied to recover water and energy from wastewater. CO2 is pumped through each cylinder, and electrons flow along it. "Using this architecture, we directly deliver CO2 gas to chemolithoautotrophs through the pores in the hollow fibers," Alqahtani says. "We provided electrons and CO2 simultaneously to chemolithoautotrophs on the cathode surface." In Alqahtani's initial study, methane-producing microbes were able to convert CO2 to methane with 77 percent efficiency, compared to 3 percent efficiency with a conventional design. A follow-up study improved performance further by coating the electrodes with carbon nanotubes. 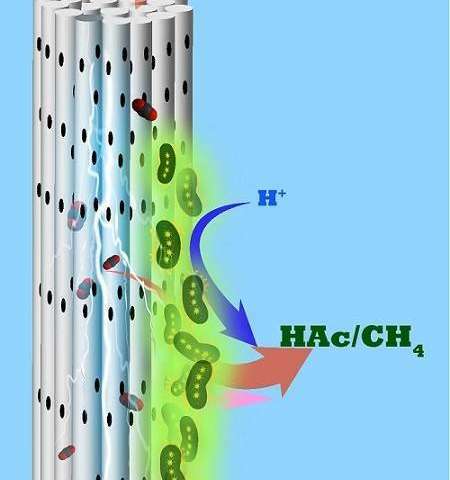 These offered a more biocompatible surface for microbial growth, and improved the hollow fibers' CO2 adsorption capability 11-fold. "Additionally, the nanotubes enhanced the electron transfer from electrode to chemolithoautotrophs," Bin says. In tests using acetate-producing microbes, production of the chemical almost doubled when the nanotube coating was applied. Alqahtani's ongoing work includes investigating easier approaches to develop porous cylindrical cathodes, while Bian is optimizing CO2 flow rates and investing renewable MES energy sources, such as solar. Both students acknowledge the valuable contribution made to their studies by Krishna Katuri, a research scientist in Saikaly's lab.